Minto makes it easy with the Stay & Play GetawaySM. Enjoy the pristine surroundings and beautiful wildlife, with eight miles of scenic kayaking and hiking trails. Rejuvenate at the nature-inspired Isles Club, with wellness amenities that celebrate life in the great outdoors. Refresh around the resort-style zero-entry swimming pool and meet your future neighbors. Plus, you’ll stay in a beautifully furnished Minto home, so you’ll see first-hand the innovative design, quality construction and included premium features of these impressive residences. 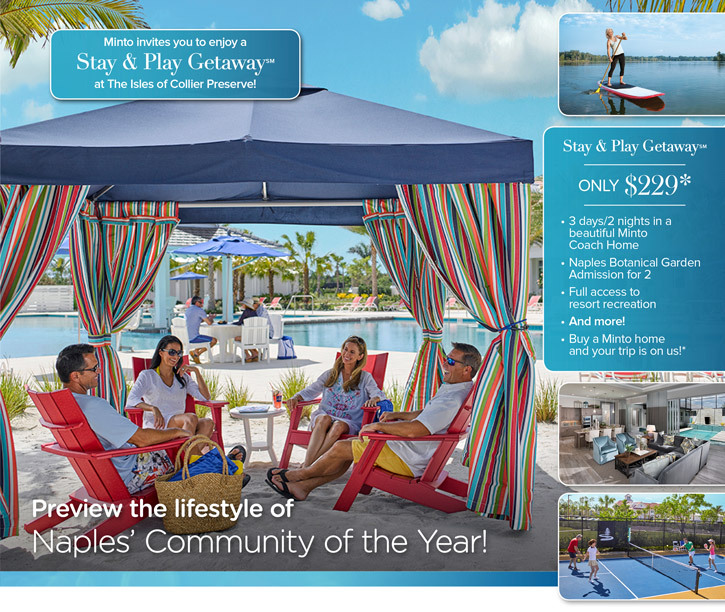 Priced at only $229*, you can’t afford to miss this opportunity to preview the Florida lifestyle at The Isles of Collier Preserve. This is a limited opportunity, so call today to reserve your Stay & Play GetawaySM!